I was going to say what sandy said! Great use of the papers! And, you can never go wrong with an abundance of enamel dots, in my book. Both of your cards are fabulous! Love the bold colors! Today is reveal day for the newest release by Simon Says Stamp: Hop To It! This is such a great release that has me ready for Spring! There are products celebrating Easter, the outdoors in Spring, lots of fun girl and animal images that are great for colouring or paper piecing, and some wonder sentiments with great fonts! SSS Shakers from Hop To It! For this first card I die cut the large stitched rectangle from Simon's Bundle of Stitches die set using Ranger Watercolor Paper and white heat embossed this fabulous new sentiment from Simon's Hand Lettered Encouragement stamp set. I LOVE, LOVE, LOVE this stamp set! So many wonderful, encouraging sentiments and the font is gorgeous! 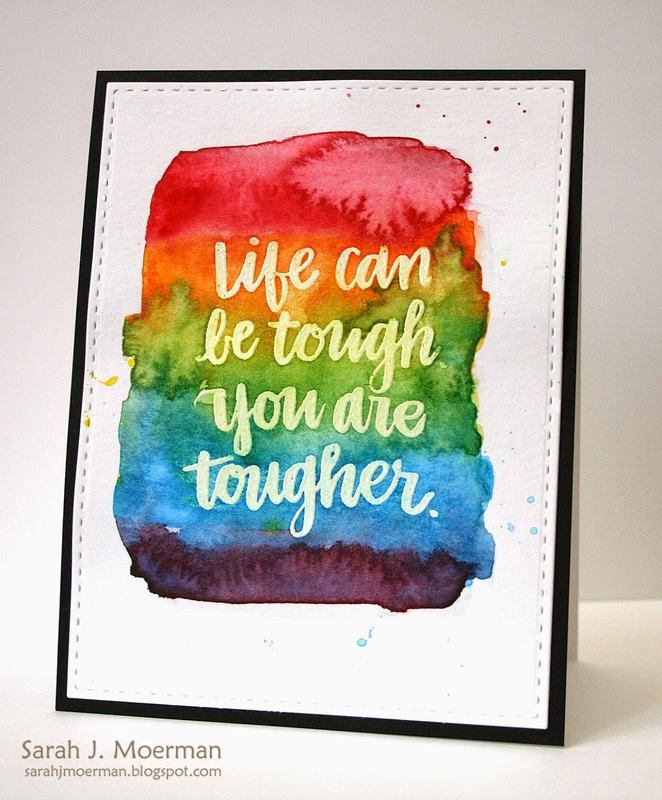 I then painted a rainbow on it with my newly purchased set of 36 Zig Kuretake Gansai Watercolors. I'm still learning how to play with these paints and love how vibrant they are! If I were to make this card again the only thing I would do differently would be to paint first, let it dry and than heat emboss the sentiment. It was a little tricky trying to remove the paint from the sentiment without messing up the painted background and still some of the color wouldn't come off the embossing. For my second card I die cut the same Stitched Rectangle from Ranger Watercolor Paper and also die cut the large cross from Simon's new Crosses die set. 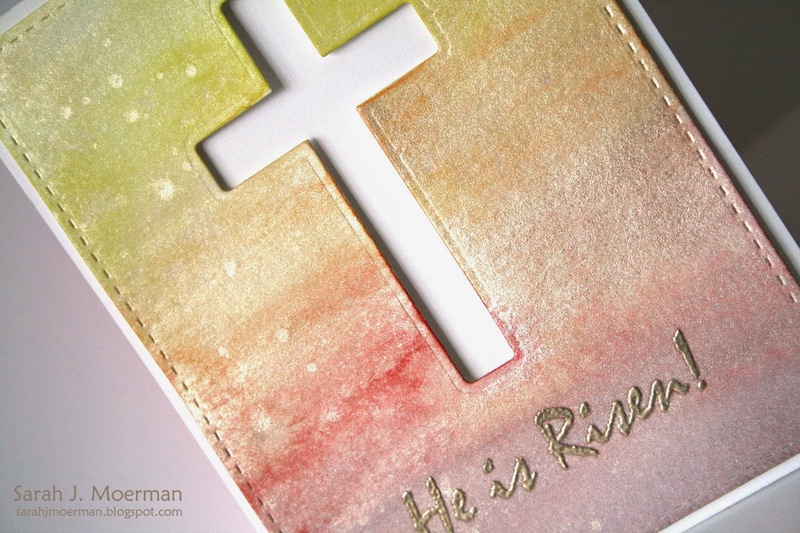 I then heat embossed the He's is Risen! 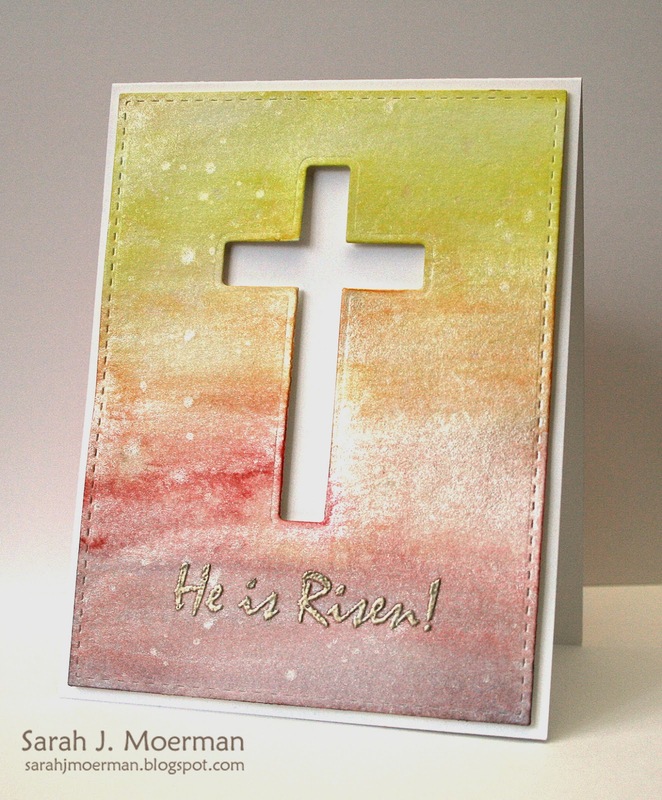 sentiment from Simon's new Rejoice stamp set. I then used the Zig Kuretake Gansai Watercolors with LOTS of water to create my sunrise background. I went over the entire piece with the Pearlescent watercolor to give it it's shine and splattered a bit of it on as well. Once dry, I adhered it to a notecard with foam adhesive. Thanks so much for stopping by! Tomorrow I'll be back to announce the winners of the Simon Says Stamp March 2015 Card Kit and my Hero Arts giveaway! Hero Arts Hostess Hop! (& GIVEAWAY)!! !